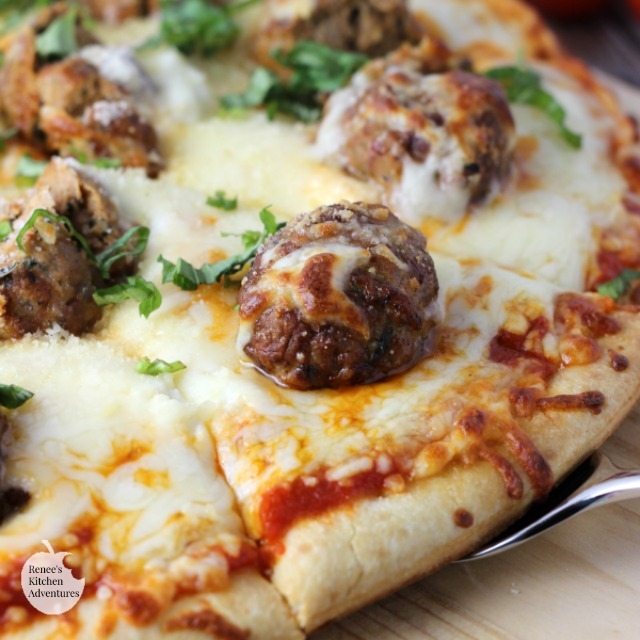 Easy Meatball Pizza is a fun and delicious, quick and easy, dinner idea the whole family will enjoy! Have dinner on the table in minutes thanks to Aidells® meatballs and just a few other simple ingredients! 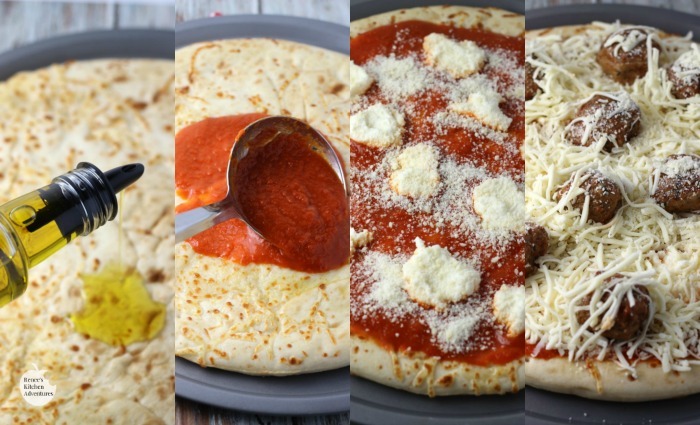 When it comes to quick and easy dinner solutions, pizza is at the top of my favorites list. 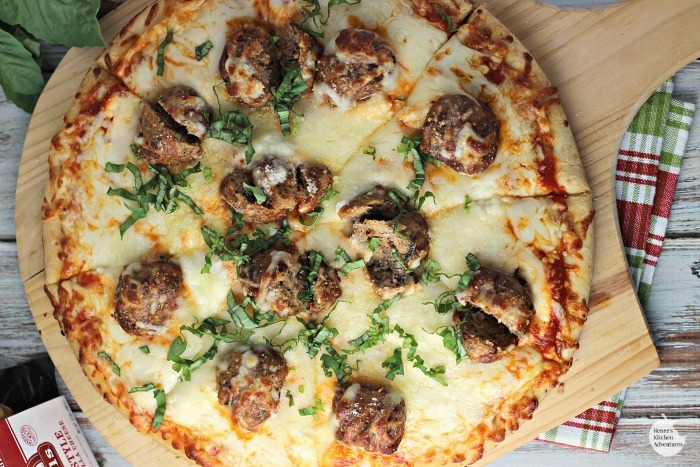 My whole family enjoys pizza and this Easy Meatball Pizza was a HUGE hit with everyone! While shopping at Meijer last week, I noticed that one of my favorite chicken sausage companies now makes fully-cooked chicken meatballs in several different flavors! 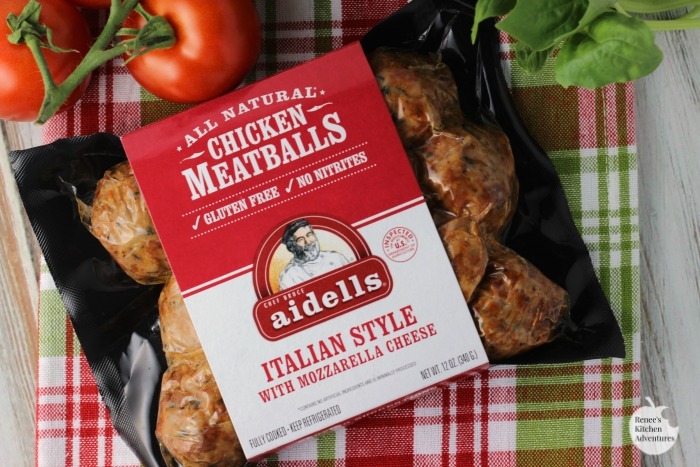 I grabbed a package of Aidells® fully-cooked All Natural Chicken Meatballs Italian Style with Mozzarella Cheese and popped them into my cart. Since my family had been requesting pizza for dinner, I immediately thought of using Aidells® meatballs in a delicious pizza creation! This pizza starts with a pre-baked pizza shell topped with your favorite jarred marinara sauce. Three cheeses give it amazing cheesy goodness and Aidells® Italian Style meatballs give it bold Italian flavor. Finish it off with some fresh basil for a uniquely delicious easy lunch or dinner in under 30 minutes! Give this delicious and easy recipe a try soon! You will love how easy it is to put together and you will love these fully-cooked meatballs! 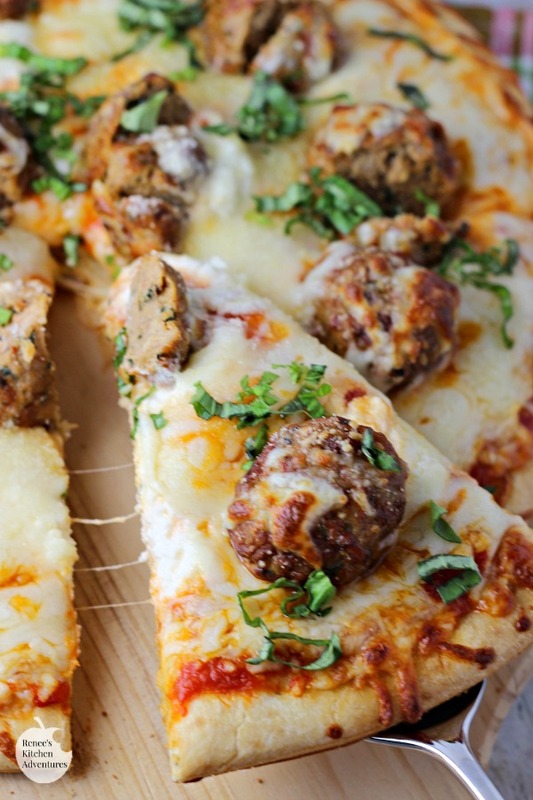 Have you ever had meatballs on your pizza? 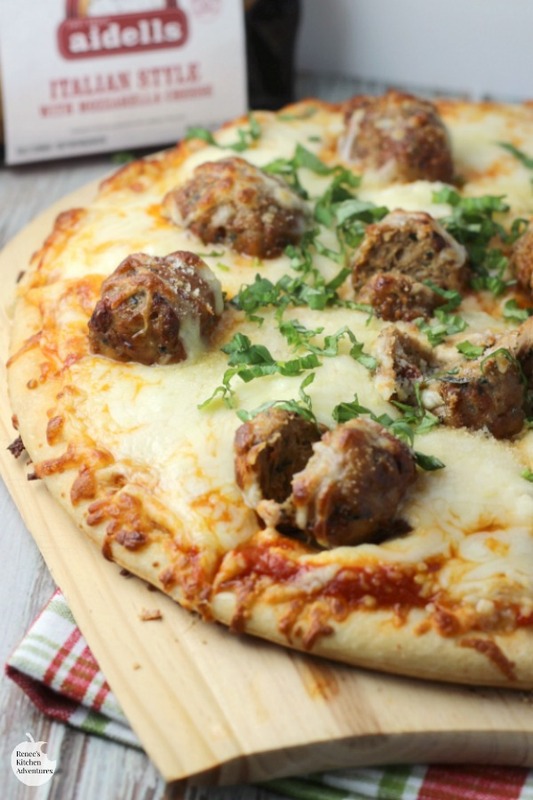 Family-friendly, quick and easy meatball pizza made with three cheeses and fully cooked Aidells® Italian Style Chicken Meatballs! Preheat oven to 450 degrees F. Put baked pizza shell on sheet pan and coat top with olive oil. Spread marinara to within an inch of the edges of the pizza shell. Drop ricotta onto marinara by teaspoonfuls, scattering evenly onto the marinara. Sprinkle with 1/4 cup Parmesan, then 1/2 of the mozzarella. Scatter the meatballs onto the mozzarella, then sprinkle with remaining mozzarella and Parmesan. Bake in oven for 8 - 10 minutes, or until the meatballs are heated through and the cheese is melted. Allow to rest for 10 minutes before cutting. Sprinkle with fresh basil right before serving. *NOTE: I left the meatballs whole, but if you prefer more meaty goodness in every bite, you can cut them into quarters before placing them on the pizza.